Lebanon is a city in Smith County, Kansas, United States, in the north central part of the state. As of the 2010 census, the city population was 218. In 1918, a scientific survey established the geographic center of the 48 contiguous US states about 2.6 miles (4.2 km) northwest of Lebanon, and a monument was subsequently erected at the site. The geographic center of all 50 of the US states is located near Belle Fourche, South Dakota. Lebanon was founded in 1876 at a site about 4 miles (6.4 km) distant from its present site. It was moved to the new site in about 1887-1888. Lebanon is named after Lebanon, Kentucky. Lebanon is located at 39°48′38″N 98°33′22″W﻿ / ﻿39.81056°N 98.55611°W﻿ / 39.81056; -98.55611 (39.810492, -98.556061). According to the United States Census Bureau, the city has a total area of 0.316 square miles (0.818 km2), all land. 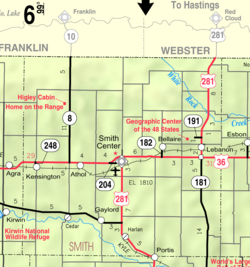 Kansas Historical Marker - The Geographic Center. As of the census of 2010, there were 218 people, 118 households, and 60 families residing in the city. The population density was 681.3 inhabitants per square mile (263.1/km2). There were 183 housing units at an average density of 571.9 per square mile (220.8/km2). The racial makeup of the city was 95.9% White, 0.5% Native American, 0.5% Asian, and 3.2% from two or more races. Hispanic or Latino of any race were 3.2% of the population. There were 118 households of which 16.9% had children under the age of 18 living with them, 42.4% were married couples living together, 4.2% had a female householder with no husband present, 4.2% had a male householder with no wife present, and 49.2% were non-families. 46.6% of all households were made up of individuals and 22.9% had someone living alone who was 65 years of age or older. The average household size was 1.85 and the average family size was 2.62. The median age in the city was 51.3 years. 17.4% of residents were under the age of 18; 2.8% were between the ages of 18 and 24; 14.8% were from 25 to 44; 40.8% were from 45 to 64; and 24.3% were 65 years of age or older. The gender makeup of the city was 48.2% male and 51.8% female. As of the census of 2000, there were 303 people, 151 households, and 91 families residing in the city. The population density was 955.5 people per square mile (365.6/km²). There were 204 housing units at an average density of 643.3 per square mile (246.1/km²). The racial makeup of the city was 99.01% White, 0.33% Native American, and 0.66% from two or more races. Hispanic or Latino of any race were 1.32% of the population. There were 151 households out of which 15.9% had children under the age of 18 living with them, 54.3% were married couples living together, 3.3% had a female householder with no husband present, and 39.1% were non-families. 35.8% of all households were made up of individuals and 19.2% had someone living alone who was 65 years of age or older. The average household size was 2.01 and the average family size was 2.57. In the city, the population was spread out with 15.8% under the age of 18, 6.3% from 18 to 24, 21.5% from 25 to 44, 22.8% from 45 to 64, and 33.7% who were 65 years of age or older. The median age was 52 years. For every 100 females, there were 98.0 males. For every 100 females age 18 and over, there were 102.4 males. The median income for a household in the city was $23,056, and the median income for a family was $28,846. Males had a median income of $22,750 versus $13,250 for females. The per capita income for the city was $12,245. About 13.2% of families and 22.1% of the population were below the poverty line, including 33.3% of those under the age of eighteen and 5.5% of those sixty five or over. On October 2, 2006, Lebanon was the focus of a study of rural flight, as local farmer Randall Warner was featured in a New York Times story about the problems faced by communities such as Lebanon. The Lebanon government consists of a mayor and five council members. The council meets the second Monday of each month at 7 p.m., at City Hall, 404 Main St.
Lebanon is a part of USD 237 Smith Center Schools. Lebanon schools were closed through school unification. The Lebanon Bronchos (or Broncos) won the Kansas State High School boys 1A basketball championship in 1977. Lebanon's status as the geographic center of the contiguous United States was a plot point in 1969 film The Computer Wore Tennis Shoes as the final question in a television quiz show. Lebanon is featured in the American television series Supernatural as the location of the former base of a secret society known as the Men of Letters. From season 8 onwards, it has become the home base for the main characters. In the TV series Salvation a Russian nuclear warhead explodes near Lebanon. Lebanon was featured in TV series American Gods, as a point for the Old Gods and the New Gods to parlay. In TV series House of Cards, during the sixth season's seventh episode, President Claire Underwood gives a speech in Lebanon. The geographic center of the contiguous United States north of Lebanon plays a reasonably important role in the book American Gods by Neil Gaiman as one of many "places of power". ^ a b "Places - Kansas". 2015 U.S. Gazetteer Files. United States Census Bureau. Retrieved 2016-03-08. ^ "2010 City Population and Housing Occupancy Status". U.S. Census Bureau. Archived from the original on July 21, 2011. Retrieved April 6, 2011. ^ Kansas State Historical Society (1916). Biennial Report of the Board of Directors of the Kansas State Historical Society. Kansas State Printing Plant. p. 301. ^ A Farmer Fears His Way of Life Has Dwindled Down to a Final Generation, The New York Times, 2006-10-02. Accessed 2006-10-02. ^ "Smith Center USD 237". USD 237. Retrieved 7 January 2017. ^ "Lebanon Overtime Win Over Sylvan", The Belleville Telescope, 7 December 1978, p.6. Wikimedia Commons has media related to Lebanon, Kansas. This page was last edited on 9 April 2019, at 02:07 (UTC).